Firstly there is a lot of theories out there about termites and your home. One: If you have black ants i wont have termites. This is false as ants generally cannot access the termite colony as termites have mud tubes that ants can't get to. 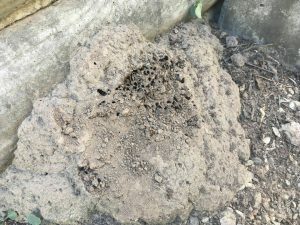 If the ants can get into these galleries they will take the termites but the termite soldiers will protect the colony while the workers fix the mud tubes. In this video these green ants are living quite happily with these termites which is rather rare. Termites won't eat my house it has hardwood frames. In fact most of the problem Australian termites are hardwood species. Furthermore we find just as many termites (white ants) in hardwood framed homes as any other construction types whether it be pine , hardwood or even steel frame homes every home is at risk . Steel frame homes you say what will they eat? and the answer is any timber skirtings, door frames and even the paper on your drywall sheeting. So this termite myth is busted. In this Video these termites (white ants) are eating hardwood sleepers. 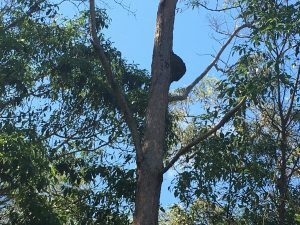 These termites are a major problem in south east Qld (Schedorhinotermes) Their colonies can cover up to 5 hectares which is a very big area and they need plenty of food. This colony found was a well established colony and we know this by identifying the soldiers. If the soldiers have two different sizes we know that it is a mature well established colony. Also the soldiers are the ones with the yellowish heads and this colony would have millions of termites. I have a house made from Cypress pine it is white ant proof and you would be wrong . Infact Cypress pine does have some termite resistant properties which is actually a good thing but termites still eat cypress pine . It's a bit like us we don't like certain things but if we are hungry we will eat it and it is the same for them . Additionally the resistant compound is in the sap which dries out after time and becomes more palatable for the termites (white ants). 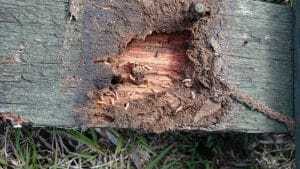 This video shows termites chomping through a hardwood fence and some stored cypress pine. The house on this property was Cypress pine framed and they got in via the subfloor into the house. I have termites in my yard if i dont disturb them they wont come into my house. This statement is one of the most common and is completely false. Termites are always foraging for food and moisture sources . A mature termite colony has millions of termites to feed including the queen who produces up to 2000 eggs a day so they need plenty of food and our homes supply that for them. So you must get a minimum of one termite inspection per year . So it is important to do termite treatments on your property which will help reduce the risk of them infesting your home. I have a physical barrier i don't need a chemical barrier to protect my home from white ants. The statement is partly false . Physical termite barriers do stop termites from entering your house through pipe penetrations and from coming into your home from underneath the concrete slab or concrete joints. But it doesn't stop them entering from the external side of your property. In fact Physical systems are designed to make termites breach and show themselves before entering your home . This is why You should do a chemical Termite barrier Treatment for your home and it is strongly recommended. As you can see almost all these myths are false and termite protection is the most important thing you can do for your home. So it is very important that you have the best protection for your most valuable asset. And you need to get regular termite inspections and make sure all your termite barriers are up to date. I see the devastation almost every day when doing termite inspections. and i can't stress enough the importance of termite protection. Whether you are buying a new home or currently own your home all i can say is get regular termite inspections or before you buy get a building and pest inspection.